Martin Kaymer surged to victory in the WGC Champions tournament with a stunning back nine of 29 in a nine-under-par closing 63. With a brilliant display of putting, the German turned a five-shot overnight deficit into a three-stroke victory over Sweden's Freddie Jacobson by collecting nine birdies in his last 12 holes. It was a great performance from the former world number one who claimed his first World Golf Championships victory with this win. 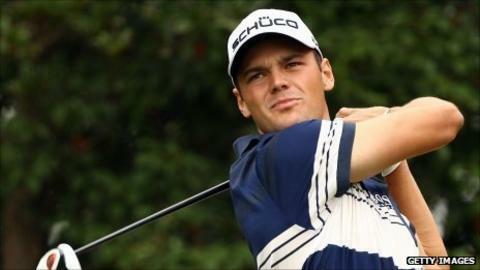 "On the back nine I made nearly every putt that I looked at," Kaymer told BBC Sport. "I can't remember a day when I have played that well. In Abu Dhabi this year I played brilliant golf but the way I played here was just amazing. "I hadn't won for 10 months. I was hoping I could get another one before the end of the year and it is nice that it is at such a big event." Graeme McDowell collected a welcome third-placed finish with a closing 67 that left the Northern Ireland man 16 under par, four strokes behind the winner. Rory McIlroy, who now embarks on a two-week holiday, finished a shot further back after a 69 that threatened to be better after the US Open champion began with birdies at the first two holes. The 22-year-old replaces Lee Westwood as world number two after the Englishman's three-over-par 75 dropped him to a share of 13th. McIlroy was joined in fourth place by England's Paul Casey, who stormed to the turn in 31 but could only collect nine pars on the inward half of a 67. But it was Kaymer's day and, of his nine birdies, it was the one he collected on the penultimate green that clinched his 10th European Tour victory. He hit a four iron into the par-three 17th and made a tough putt to go clear of Jacobson at the top of the leaderboard. Kaymer followed it with a birdie at the par-five last, while Jacobson dropped a shot at the 17th to effectively lose any chance of victory. The Swede, who had led overnight, settled for a one-under-par 71. Having been world number one earlier in the year, Kaymer now climbs two places in the world ranking to number four and has taken his European Tour earnings to more than €2m (£1.71m) for the third season running. Justin Rose was left heading to next week's event in Singapore rather than back home after failing to claim the top-six finish he needed to be sure to be eligible for the season-ending Dubai World Championship. The Englishman finished seventh and needs to play in either Singapore or Dubai to be sure of playing sufficient European Tour events to be eligible for 2012's Ryder Cup.